In answer to a flagrantly libelous article that went viral on Ranker, wherein the author made some wild extrapolations in regards to the characters of A. 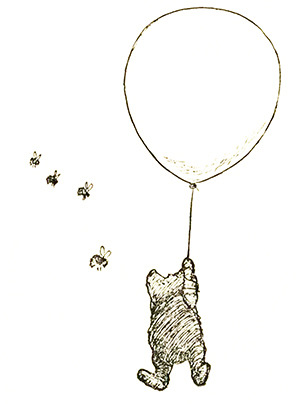 A. Milne's Winnie the Pooh books, I have this response: You are wrong. Cheryl Adams Richkoff, although your list-format blog post was based on the research of neurologists and pediatricians, namely Sarah E. Shea, Kevin Gordon, Ann Hawkins, Janet Kawchuk, and Donna Smith in a study in 2000, I have to question whether any of y'all have ever read even one of Milne's classic books. The assumptions about the psychological disorders that the playmates of the 100 Acre Wood suffer from over-analyze, overreach and overlook the most important theme of Milne's characters: childhood innocence and imagination. From my extensive research into the material, I believe Milne actually stumbled upon childlike versions of what are actually full fledged personality types in the psychological realm. So, Mr/Ms. Richkoff, Shea, Gordon, Hawkins, Kawchuck and Smith, try some Poohology on for size. I'm betting you're a bunch of Owls. Christopher Robin is a young boy with very little life experience, yet in the eyes of his friends in the 100 Acre Wood, Christopher Robin is an unstoppable force of brilliance and a magnetic director of events. Christopher Robin is unintentionally the guiding voice to people all around him, in all walks of life, old or young, he is a natural, however accidental, leader. People look to him for advice and direction, and unwittingly draw insight from every casual remark. Christopher Robin does not seek followers, nor consider himself much of a leader. He is charismatic but matter of fact. He is pragmatic and black-and-white about issues. He is logical and develops solutions without really trying. 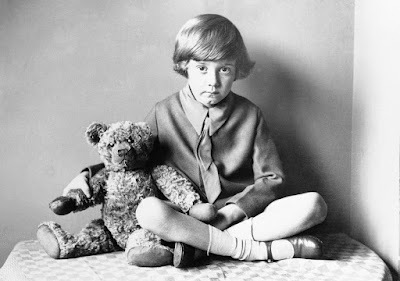 Christopher Robin’s weakness is a certain ambivalence to his ignorance. He is the master of fake-it-til-you-make it, and can lead the blind blindly into chaos and mayhem. A wiser and more mature Christopher Robin begins to operate in awareness of his followers and make choices based on the outcome for all. He is confident (externally), curious and occasionally prideful. He can be defensive, or humble, depending on maturity and context. Christopher Robin is a loyal friend unless his aptitude is questioned. He can easily walk away from a person that threatens his self-confidence and perceived position in life. He usually has many casual friends and one or two close confidences. Even with those he is deliberate and guarded in communication. Vulnerability is a rare trait for Christopher Robin, but demonstrates health and maturity. He works well with all of the other characters, but has a special fondness for Pooh (the abstract intellectual) and Piglet (the selfless loyalist). He is a problem solver and an instigator. He is relied upon heavily by all of the other characters. He thrives on taking care of the others and being dependable and trusted. He is a hard worker but can be easily misled or distracted sometimes, this also depends on maturity and humility. Nobody quite knows where Pooh comes up with his brilliant ideas, but somehow, they always make sense. Getting from point A to point B is usually a profoundly complex route through Pooh’s stuffed-with-fluff head, but he gets there, and usually right on time. Pooh is predictable, dependable, logical in his own strange way, and a steady emotional anchor. A mature and healthy Pooh provides an atmosphere of safety and reliability to all of the characters, all though they lose patience with his round-about reasoning. He is not usually very industrious, but will pitch in when asked, and promptly get distracted. He is usually not a multitasker. Winnie the Pooh is somewhat of a mystery to many of the other characters. He is usually well liked, but often held at arms length. He works best with Piglet, who serves as his interpreter to concrete thinkers like Rabbit and Tigger and Kanga. Pooh is quite intelligent, but not always in a practical way. His solutions are not always implementable, but his thought processes provoke some fascinating insights. Characters like Piglet and Roo, and occasionally Tigger, are drawn to his rambling intelligence and can be followers. Pooh is usually somewhat unaware of the other characters and their needs. He can be somewhat introspective and be blissfully unaware of crises around him. When these problems are pointed out to them, he is eager to help, and sometimes happens to land on a stroke of appropriate genius. He is a giver, but he is also mildly greedy. He cares deeply for people but an immature Pooh does not communicate this very well. He can come across as self-focused and uncaring. Pooh likes everyone but does not feel the need to seek out or pursue relationships, other than with Christopher Robin. Most friendships come find him, and if they go away, he won’t necessarily notice. "And then Piglet did a Noble Thing... 'Yes, it's just the house for Owl,' he said grandly. 'And I hope he'll be very happy in it.' And then he gulped twice, because he had been very happy in it himself." strangers – when it comes to the protection of someone else, he is fearless and proactive. His self image is usually frail enough that he can’t see the same course of action in his own defense and is often taken advantage of by characters who prey on his loyalty. Piglet is intelligent and very logical. He is successful in most endeavors and unfortunately, much of his success is usurped either intentionally by unhealthy individuals or unintentionally by unaware characters like Pooh and Owl. Piglet will be the last one to state his own needs, but he is a homebody and is very particular about his own lifestyle. He is expressive in his own comfort zone, but does not feel the need to broadcast his individuality. He would very much rather not ever be the center of attention, and when he springs to someone else’s defense, his only holdback is the realization that he is drawing attention to himself. Usually a price he is willing to pay. Piglet can ultimately develop hard feelings and become cynical, but he compartmentalizes these feelings and tries to pare out bad relationships. He is a one-friend kind of guy usually. He gets along with most characters but will only invest heavily in one or two characters at a time. He likes Pooh because Pooh needs an advocate, and Piglet is just the man. He and Rabbit identify in certain areas, as well as Kanga, but Tigger overwhelms and annoys Piglet usually, unless Pooh is there to run interference. Piglet avoids conflict and is a peacemaker, usually at his own expense. He is also a little bit prideful, and easily embarrassed (refer to center of attention discussion before). He doesn’t handle attention very well, negative or positive, and would rather just not be noticed. "Piglet lay there, wondering what had happened. At first he thought that the whole world had blown up; and then he thought that perhaps only the forest part of it had; and then he thought that perhaps only he had, and he was now alone in the moon or somewhere, and he would never see Christopher Robin or Pooh or Eeyore again. And then he thought, 'Well, even if I'm in the moon, I needn't be face downwards all the time,' so he got cautiously up and looked about him." Thanks to Walt Disney, everybody has got Eeyore pegged all wrong. Eeyore is a realist. He sees things the way they are, in black and white. He has good days and bad days and expresses them very openly and emotionally. While everyone else can make the most of a bad situation Eeyore will patiently face the negative and hope for better luck next time. Eeyore is intelligent and thoughtful, aware of others and their needs to a fault. Eeyore can be depressive or exuberantly joyful. He is creative whether he is talented and artistic or not. He is a plodder. He keeps going, a slow and steady pace, regardless of the situation. He is a great friend for those that can tolerate the emotions he wears on his sleeve. He’s somewhat competitive and enjoys a good friendly debate. He doesn’t like conflict but he does enjoy negotiation. He has utmost respect for Christopher Robin for his creativity, but can see CR’s haphazard underqualifications. Eeyore acknowledges Rabbit as the leader he is but loses patience with Rabbit’s disconnected emotions. Eeyore and Tigger have a love hate relationship because they are the most emotionally expressive characters, and often find themselves in direct opposition, i.e. the thing that makes Tigger exuberant is often Eeyore’s bain, and vise-versa. He is good friends with Piglet and one of the only characters intuitive enough to not abuse Piglets’s selflessness. He is one of Piglet’s only defenders. 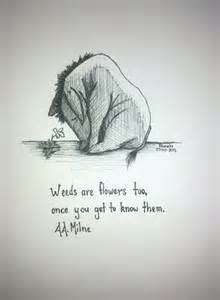 Eeyore has little use for rambling philosophies or bloviating. Pooh and Owl often annoy him, as he can be somewhat selfish and doesn’t like to waste time or energy on things that seem vain or useless to him. 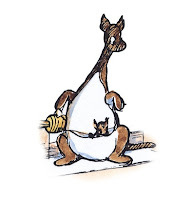 He does not like to be mothered or bossed around but he can establish a good rapport with Kanga and Rabbit. Surprisingly, Eeyore gets along well with Roo, and can tolerate immature characters better than most, perhaps because they also wear their emotions honestly and unabashedly. Tigger is a whirlwind of emotion and energy and spastic motivation. He is intelligent but so often distracted that his thoughts don’t ever connect. Tigger likes almost every one immensely, but his chief concern is being known for who he really is,“the only one”. Tigger is compelled to feel unique. He becomes intolerable when his uniqueness is threatened or the attention is not fully on him. Tigger is highly opinionated but lacks the pride that causes conflict in this area. He is overwhelmingly curious and opposing opinions trigger more questions in his mind, which he will pursue until he gets distracted. Tigger rarely follows something through to absolute completion. He is full of big ideas and great beginning energy, but finds it hard to stay on target until the end. Most of the other characters enjoy the entertainment that Tigger provides, and calculate the loss that Tigger’s unintentional clumsiness may cost as well worth the friendship. Tigger is the character that will make everyone else late for an event, or invite too many people, or commit social faux paus without even knowing there are lines to be crossed. He creates a headache for Rabbit who truly admires his wanton joy, but feels compelled to complain about it. They are a surprisingly strong relationship, though both will protest. Tigger can also become depressed, and his saddest moments make Eeyore look like a clown. He gets along with Pooh and Owl but is easily bored with their rambling. He and Piglet often end up toe to toe because Tigger has carelessly offended another character, a wrong which Piglet feels compelled to right. Tigger is brave and will try anything. He responds to dares and bets and sometimes he talks bigger than he can follow through on, which again results in conflict between characters. Tigger loves to take care of others, but can’t usually think outside of his own tastes and preferences, and has difficulty providing needs that aren’t similar to his. His energy is infectious and for all of the damage he inflicts accidentally, he is usually a welcome part of anything going on in the woods. Tigger can also be a work-horse, and is far from lazy. He can be a good multitasker when he is healthy and mature. "'Rabbit's clever,' said Pooh thoughtfully. 'I suppose,' said Pooh, 'that that's why he never understands anything.'" While it’s true that Rabbit is somewhat of a worrier, no other character in the hundred acre wood is as productive and logical. Rabbit is one of the only characters that makes things happen. Rabbit is also one of the few characters that can save the others from the brink of disaster and recover from most catastrophes. Rabbit thinks ahead. He sees logical solutions very clearly, and operates mostly in black and white. He is usually extroverted, an excellent multi-tasker, and gets along well with most characters. Tigger tries his patience to no end, but also give him a perpetual project. An unhealthy Rabbit can become very manipulative, and with his keen tongue and intellect, can easily accomplish his goals at the expense of others. A healthy Rabbit reaches these goals by using cynergistic and cooperative methods. Rabbit is the only character that can really pull the whole crew together to make an absolute success. He is detail oriented and very observant. He cares for others and will bend over backwards to provide for them according to very formulaic and logical needs. He can be very good at controlling his emotions, but he feels things very strongly and is good at expressing himself. He is vociferous and very much a take-charge type. While he doesn’t care about being the center of attention, he is very much concerned with being effective and productive, and will dominate the group to make things happen. He can be smart almost to the point of manipulation in getting the ear of Christopher Robin to coordinate plans. Rabbit has a very tender side that is nurturing and selfless. But for Rabbit, everything must be done in the right way, the correct order, and meet all of the rigid standards he has set for himself and everyone else. Rabbit goes through occasional burn out, but always bounces back to keep the group functioning. Kanga is one of his biggest supports, but they often disagree on implementation tactics. "'Ah!' said Rabbit, who never let things come to him, but always went and fetched them." Owl’s strength is his knowledge retention and perpetual quest for information. While he may lack self and others awareness, he can usually make up for it by providing necessary information to the people in his life. Often detached from the bigger picture, Owl gets somewhat preoccupied with his own interests and forgets that everyone around him doesn’t share this preoccupation. Many Owls become specialists in a specific field because they are keenly interested in something, although some become general knowledge hounds and might be drawn to teaching or other information-based work. 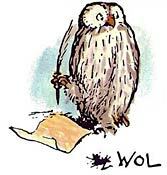 Whole Owl is very intelligent, common sense and basic things like spelling sometimes escape him. He is more brilliant than practical, in many cases. Owl’s concern for others is manifest in helpful ideas and suggestions usually rather than actions. He often provides direction (which may or may not be practical and useful) and instruction for the doers around him. He can be an effective leader, but won’t generally be a great follower or employee. Owl has a sensitive ego that needs to be stroked, but is also fairly good at self-generated confidence, based on his objective knowledge of his own skill level or useful contribution. Owl is not highly emotional or easily swayed but misfortune of his own or that of others. He’s fairly pragmatic and practical, if he’s not too much in his own head. “'I don't know if you are interested in Poetry at all?'" 'Hardly at all,' said Kanga"
Kanga is everybody’s mother. Always in tune with the needs of the people around her, she can also project forward and anticipate future needs. She’s meticulous and thorough in her administration, but organizationally she operates according to a very personalized system. Kanga is a planner and does not like to stray from the designated pathway. She is reticent to relinquish control or follow blindly without explicit understanding. Kanga is usually a homebody - not adverse to socializing, but not seeking it out. She cares deeply for the ones closest to her. More in tune to the needs of those around her, whether they agree or not, Kanga is more empathetic than Rabbit, with whom she has quite a bit in common. Fastidious and something of a worrier at times, she is happiest in a world that she feels in control of. Extremely focused and not easily distracted, it takes quite a bit to get Kanga to engage in frivolous behaviour except very occasionally. "She knew at once that, however big Tigger seemed to be, he wanted as much kindness as Roo." Authors note: The Roo personality is a questionable standalone. Originally, I considered Roo the representation of childhood, a follower-type persona (see Stage One of Mark Manson’s four life stages) that we all eventually grow out of. That being said, I am re-examining the Roo character and am including him in the lineup for the time being. Roo is the one you want on your team. Perpetually enthusiastic and courageous, his curiosity about life is contagious. What he lacks in organizational skills he makes up for in zeal and willing participation. Arguably the universal embodiment of childlikeness, some Roos never grow up. He might make a great employee, but is dangerous in a leadership position a he is usually not in tune with the bigger picture or very good and thinking or planning ahead.